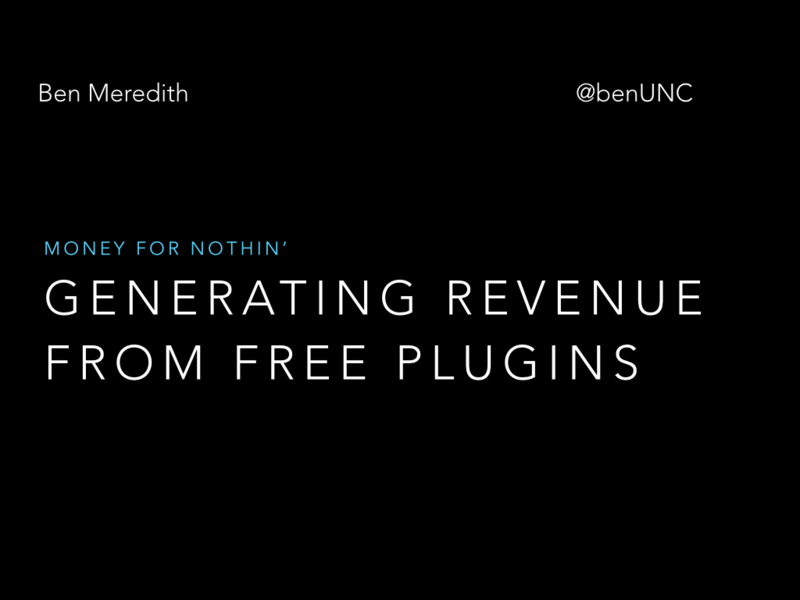 This is the full content of my first-ever WordCamp talk, given on the developer track at WordCamp Raleigh 2015. Click the images to make them bigger. Because a slide deck (alone) of my slides wouldn’t be all that helpful. Back in 2012 I made a switch from retail sales (making good money) to telesales, selling auto repair websites over the phone. In 53 working days before I was fired, I learned 2 things: First, people from NC selling things over the phone to people in NJ should speak faster. Second, I learned that I’m not great at empathy. Empathy is the ability to place yourself in someone else’s shoes and feel what they feel. As a part of the interview/hiring process, that little company did a series of personality and aptitude tests, checking my ability to sell things. 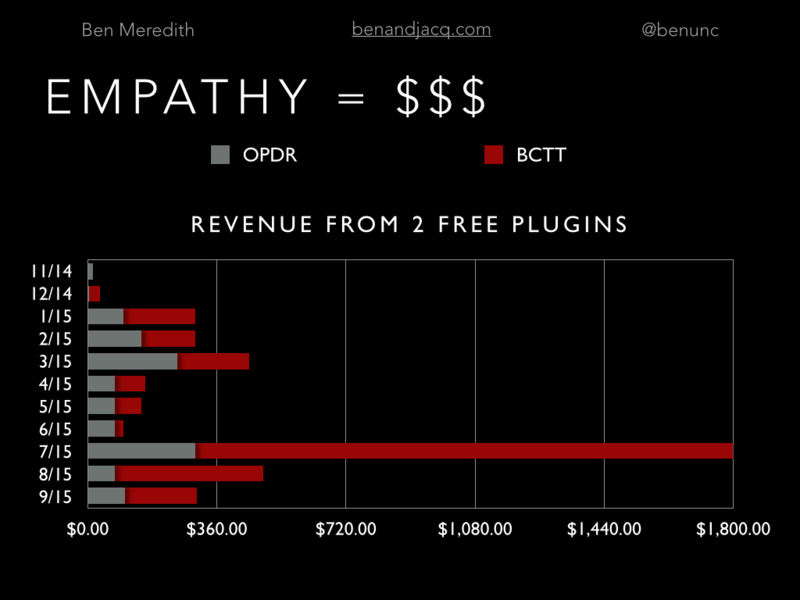 One of the metrics they tested for was empathy. On a scale from 1 to 100, with one being a psychopath with no ability to empathize and 100 being someone who is very very good at empathy, I scored a 2. That was given as the primary reason for letting me go. 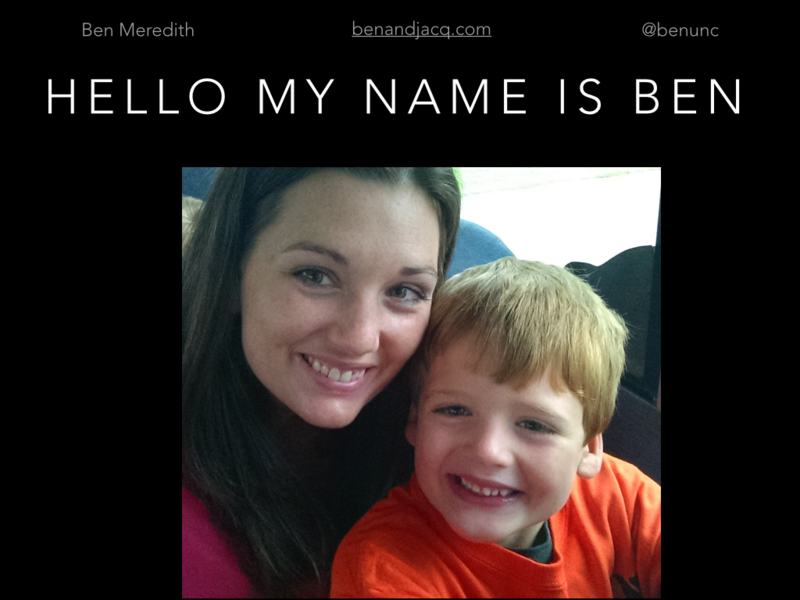 I tell you all of that to say: Hello, my name is Ben, and I’m not great at empathy, yet I’ve used empathy to generate revenue. For the record, I do think I need a recount, because I don’t think I’m actually that bad at empathy. But the recognition that I have a sizable blind spot in this area has been hugely helpful, across many facets of my life. 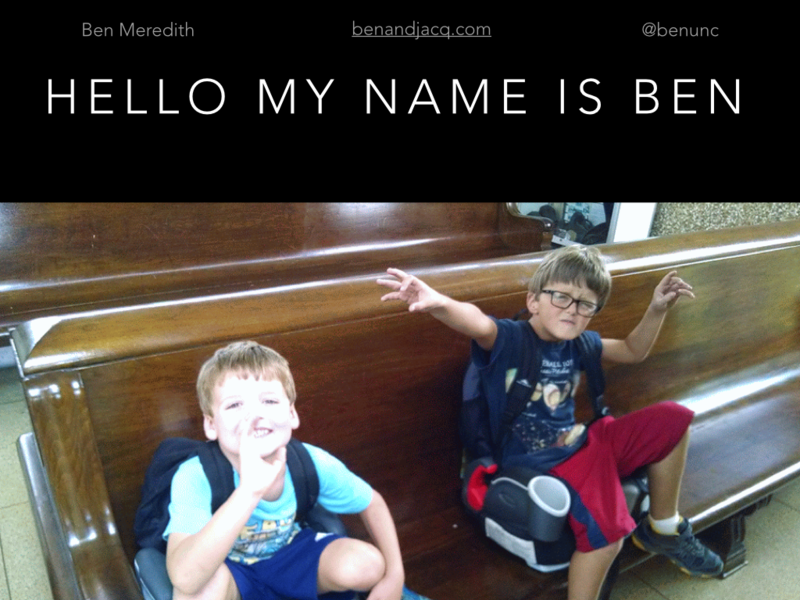 By way of introduction, I’m a plugin developer, husband of one, dad of two, church musician, and homeschool dad. Here’s some pictures of my family. 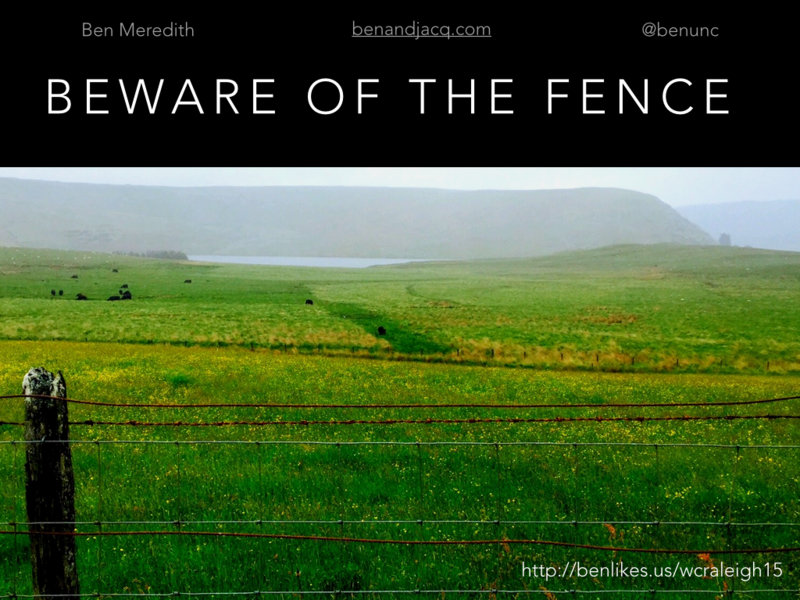 My thesis for this talk, based on personal experience, is that empathy equals money. I have two plugins both around a year old, both free, with no plans to officially monetize with a premium tier or paid support. You can see (by clicking on the slide) that, just from interactions in the support forums at wordpress.org I have generated some cash. In most cases it has come from solving problems in a way that is helpful, and by putting steps in my workflow to help with my empathy blind spot. In the rest of the talk, I’ll briefly share those steps, and how you can add empathy. But first, I need to convince you that you are not great at empathy. 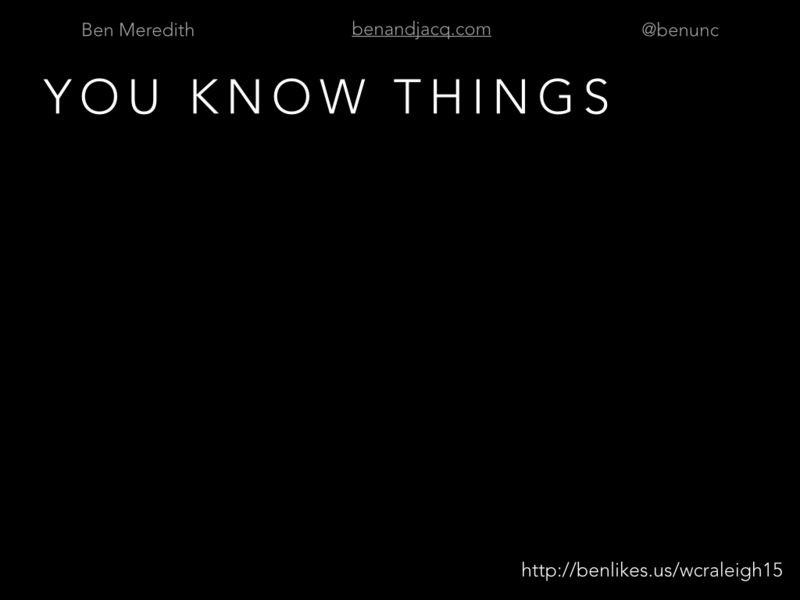 The problem is that you know things. In their 2007 book “Made To Stick” Chip and Dan Heath tell the story of Elizabeth Newton, who earned her Ph.D in psychology in 1990 in part due to her research into what is called the curse of knowledge. In her experiment, she split a group of people into tappers and listeners. Tappers were given the title of a popular song (think along the lines of The Star Spangled Banner or Happy Birthday to You) and asked to tap out the melody on the table without humming or singing, for the listeners to guess. Before they guessed, the tappers estimated the percentage of correct answers. Tappers estimated that listeners would get the song correct about half of the time. In reality, once the guessing started the listeners had a rough go. They correctly identified only 2% of the songs. Here’s what was happening in the tappers’ minds: it’s impossible to tap out the melody of a song without hearing the song in your head. And that insider knowledge is next-to-impossible to ignore in making an unbiased judgement. You can’t forget it. Psychologists call that the curse of knowledge. There’s another psychological issue at work here, as well, called “hindsight bias.” An illustrative alternative name for hindsight bias is the “I knew it all along” syndrome. This theory is that once you know the outcome, you forget the specifics of how that outcome came to be, or the likelihood of other outcomes. This shows itself in diverse fields like politics, sports, world history, and yes, development. Not only are you cursed with knowledge, you’ve forgotten how you learned it, and how long it took you to learn it. 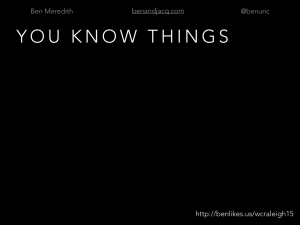 My point is that you know things. You know that when you read the word WordPress that the P is capitalized. 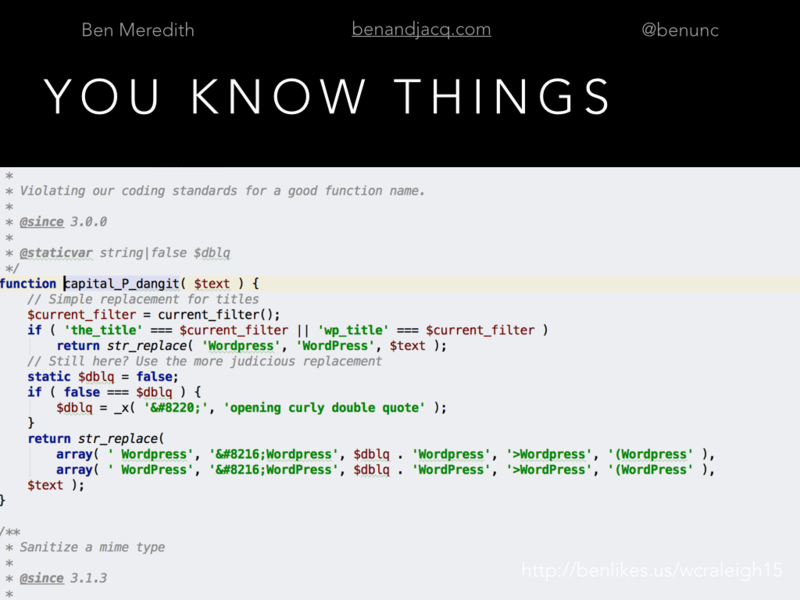 If you are a little more savvy, you know that there’s a function in WordPress core that enforces the agenda of the militant capital P-ization regime. 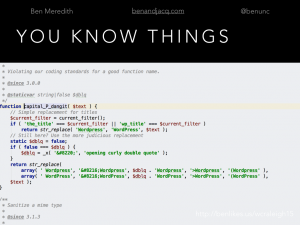 If you are even a little bit more savvy, you know that the name of that function violates the coding standards of WordPress, and you are likely OK with that. All of this knowledge makes it very difficult to handle when someone doesn’t capitalize the P in a tweet. You’ve forgotten what it was like to not know that. While this is a lighthearted example, there are tons of other things about which you have insider knowledge, and hindsight bias, and these are the main things standing between you and empathy. 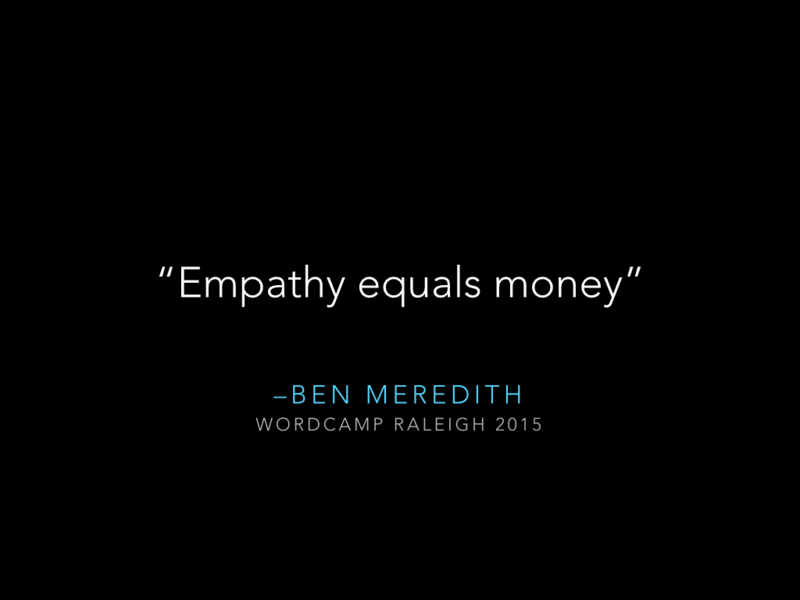 And as the famous WordPress philosopher said back in 2015 at WordCamp Raleigh, Empathy equals money. So how do we grow in empathy, and turn that empathy into money? We have to first and foremost recognize that we are WordPress. When a user has an issue and goes to the support forums, when you respond, you are WordPress, to them. So it is helpful to think through that lens. 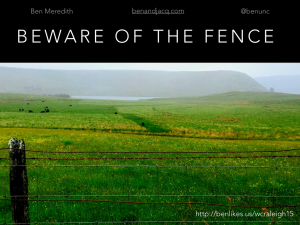 Now that we’ve identified that something is standing between you and the green pastures of empathy, we’ve got to set up some guidelines to help you hop the fence. So, keeping in mind that you are WordPress to your users, allow me to define three things that have helped me (as an empathy-challenged developer) to bridge the gap between me and my users. First of all, this is not a great place for a rough draft. (sidenote: I hijacked a relatively mild one-star review on the forums using Chrome Dev tools to hyperbolically change almost everything you see on this slide, with the exception of the poor guy’s avatar.) I do all of my rough drafts in Google docs or some other word processor, because they are actually ROUGH. Related to this, I never respond within 24 hours to less-than-5-star reviews or unkind support requests. Give it some time. 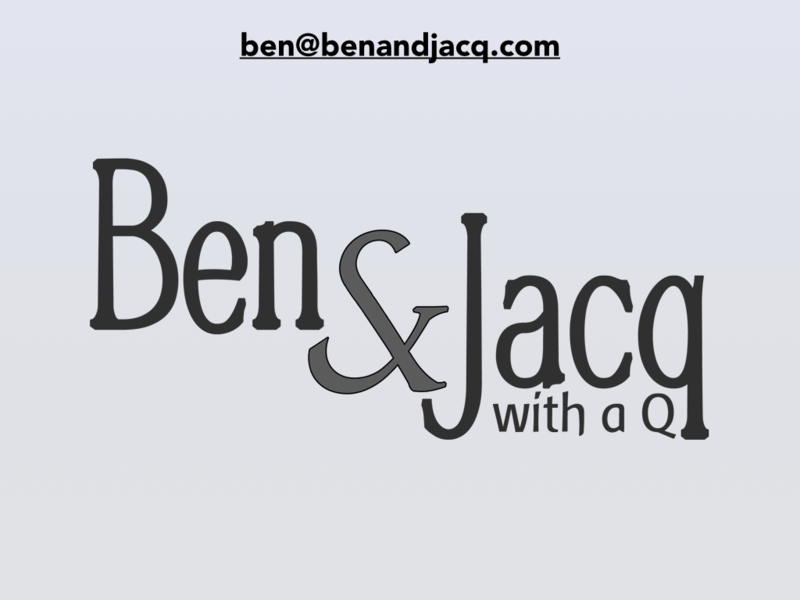 Another helpful thing I’ve found is to give my users a face. 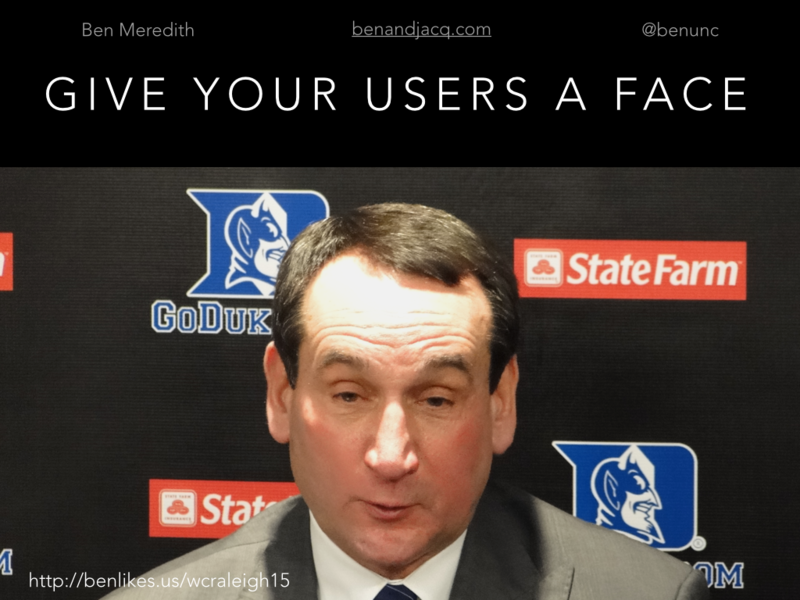 Instead of giving my users a face, I give my AUDIENCE a face. See, when people start support requests, they often use my name. Why? Because before they submit a ticket, many users read through the forums to see if their question has been answered. And they see my name, and read my responses. These people are my audience. I can hear the responses… “but users don’t read!.” And that’s right, some users don’t read FAQs or other support tickets. But some do. 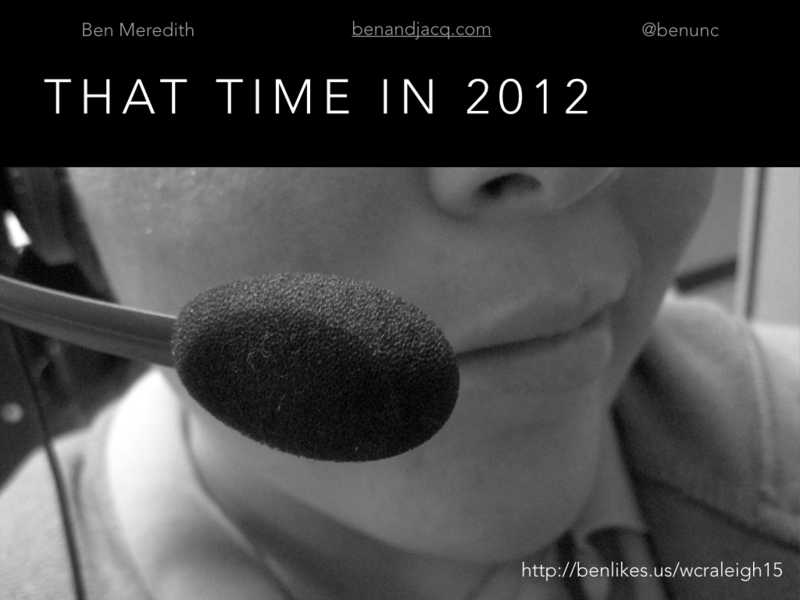 Ones with $10K budgets and enterprise clients do. The type of people you want to notice you are reading your support forum responses, to see how you react to trolls. Answer like they are watching. I only left this image large because I refuse to make Coach K’s face bigger than my Grandpa’s. That’s Jesse Raymond Meredith Jr. My Dad is Jesse Raymond Meredith III, making the handsome fella you see here my Grandpa. He was an illustrator for Western Electric* for years, drawing the pictures in instruction manuals. I remember him telling me the story of drawing the diagram on how to load artillery in a specific military manual. He was proud of his job, and what he did to serve his country. He was the type of man who wouldn’t lie to you, even if it cost him $1,000 to do it. Early in his career he was audited by the IRS, which meant taking a half-day off work, packing a briefcase full of tax related documents to prove that he had paid the correct amount, and spending hours of his life politely answering questions. This wouldn’t have been much of a feat, had it not happened year after year. Once he got on their list, he was repeatedly audited. Each time he’d respond with respect, and kindness. He’s the face I imagine watching me when I respond to support tickets. If he were looking over my shoulder and I told a user to RTFM, he’d smack me in the mouth. It doesn’t matter how asinine the request, I’d better respond with respect. So after I’ve installed a filter on my knee jerk reaction, and given my audience (not my users) a face, the next step is to put another stop-gap in place. 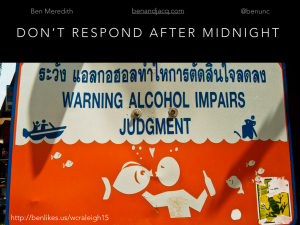 When it comes to negative reviews, or even mildly annoying support requests, I never respond after midnight, or alcohol. This is an extension of the filter of not writing a rough draft on the forums, but once that draft is written, and I look at the clock, if it’s after midnight (even if it’s the next day and I’ve observed my 24-hour rule) I save the file and close the computer. I’m a much nicer person in the morning. Empathy is not even a possibility after midnight. Those are my three tips for growing in empathy. 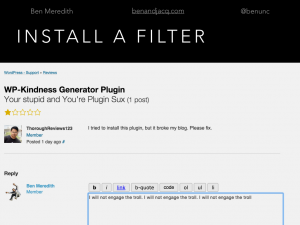 First, install a filter. 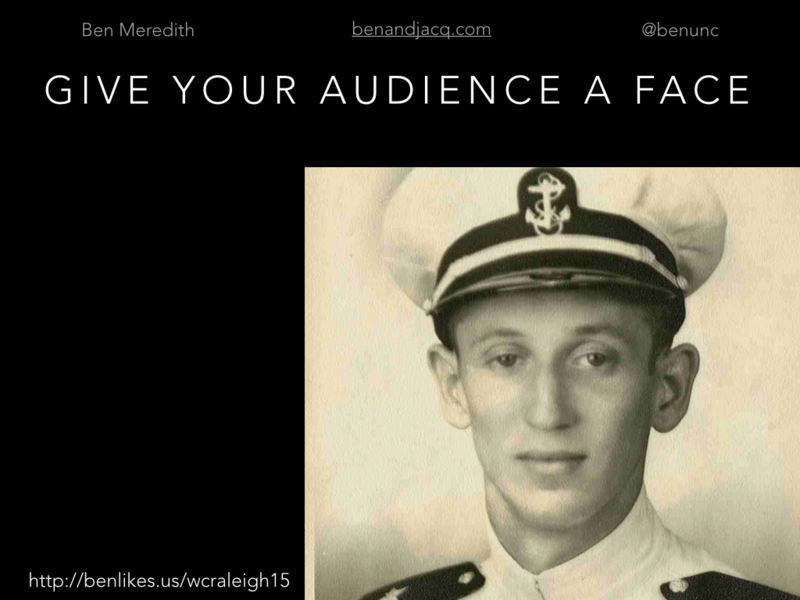 Second, give your audience (not your users) a face. 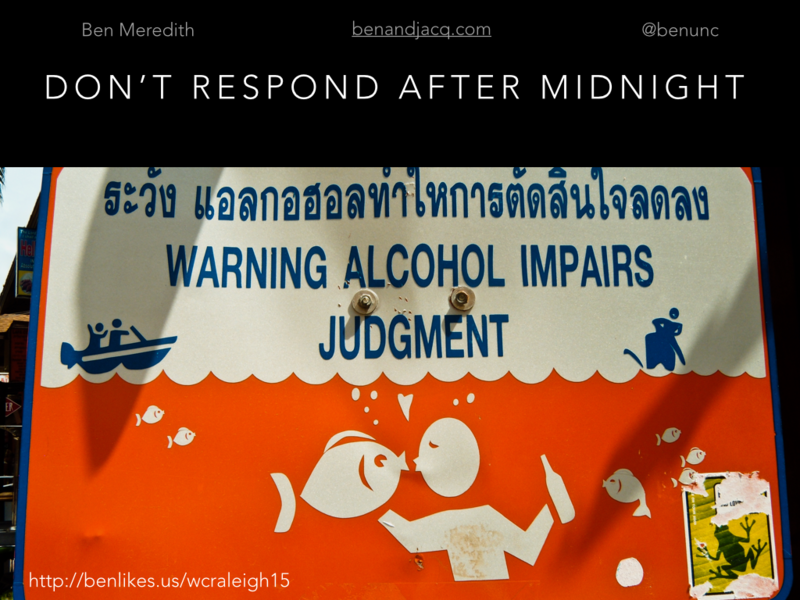 Finally, don’t respond after midnight (or booze). One last tip, and this is just a personal gripe. 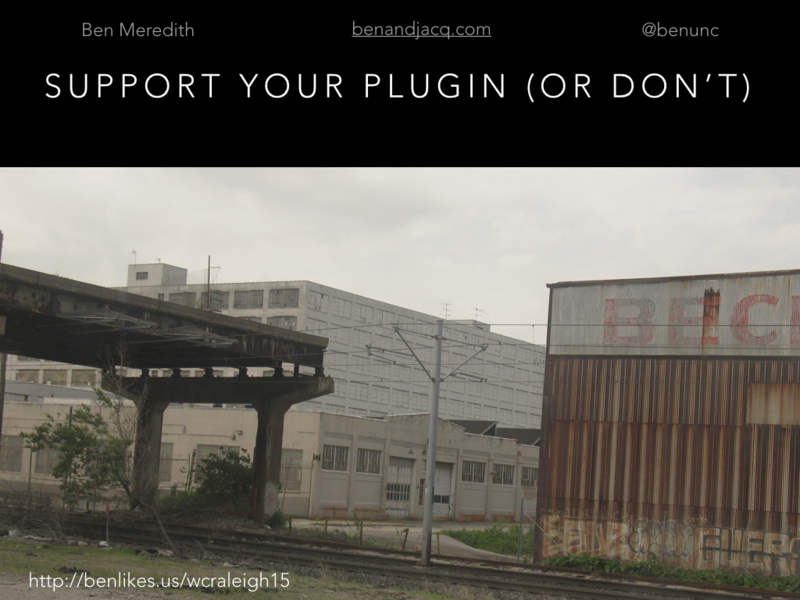 Either support your plugin well, or don’t support your plugin. 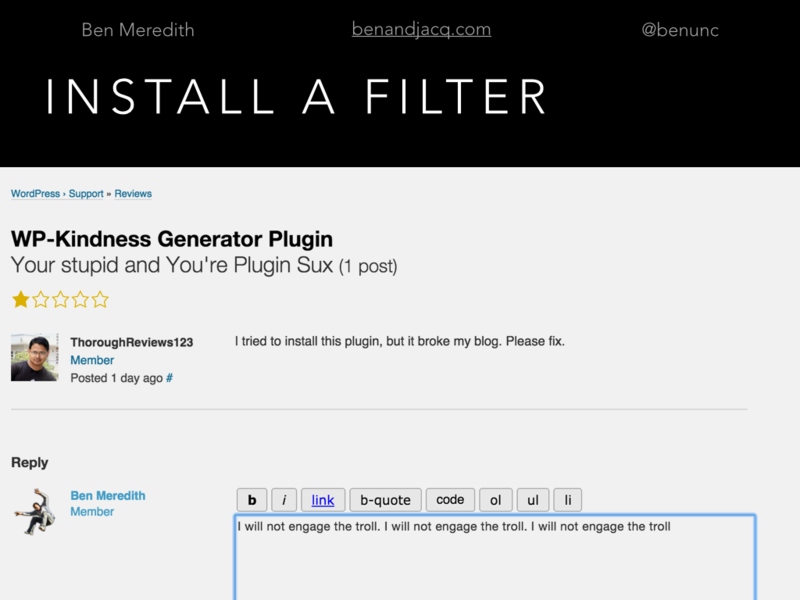 I’m totally fine with not supporting your plugin for free on the forums. But if that’s the course you take, make it obvious. Tell your users on the FAQ, pin a post to the top of the support forums, and write it about every third line in the readme. Make it clear that support is not provided. 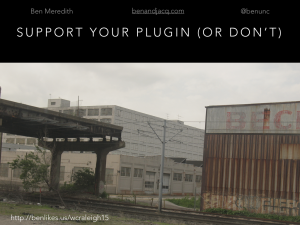 It should be noted that I think if you are going to release the plugins on the official repo, and not support them, you are doing the community a disservice. The least you can do is to tell people not to expect support. 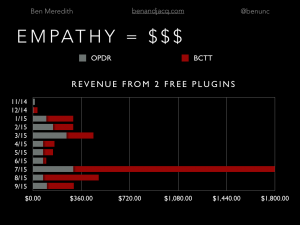 If you combine your technical knowledge with a sincere desire to grow in empathy, take it from a guy once labeled nearly psychopathic, you can grow not only in empathy, but in revenue. *an earlier version of this (including the original talk) incorrectly identified his company as “General Electric.” I should fact check my own memory. Western Electric later became AT&T.